Autumn Leaves — For Manhattan drinkers. It’s boozy, herbacious, and heavy on spice for those who like bold, complex drinks. Hauptmann Cocktail — A sour-style drink for light drinkers. Very easy on the palate (and the liver), with aromas of orange peel, a velvety texture, and a malty, citrusy flavor. The Battery — An Old-Fashioned variation for those who like to keep it simple but interesting, the focus being the base spirit — in this case, Lapsang Souchong-infused bourbon. Black Bart — An creamy dessert drink for the after-dinner tippler, it’s a variation on the White Russian that features Root Liqueur and cinnamon — kinda like a melted root beer float. 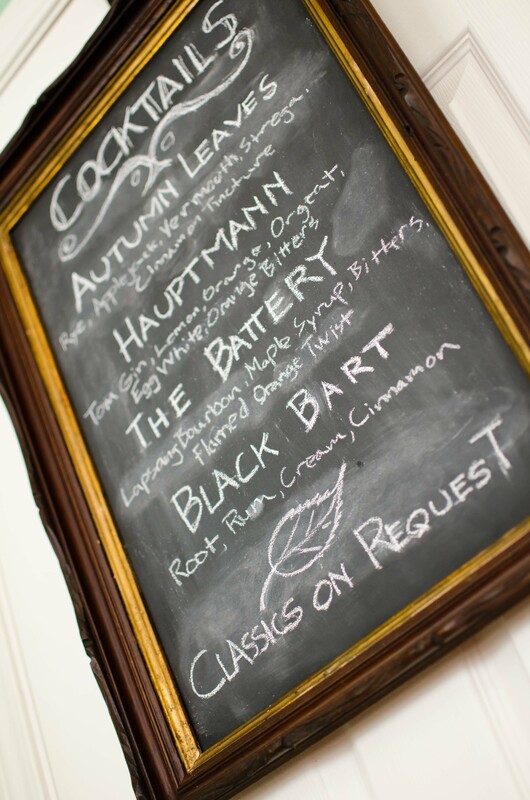 Far and away, the Black Bart was the most popular drink of the night, followed by the Autumn Leaves and the Battery. The Hauptmann had surprisingly few takers (is it the egg white? who knows? ), but was well-liked by those who sampled it. A rousing success by any measure, I think. Most of the drinks on the Long List are decently known (the hyperlinks show which have been covered here on Tempered Spirits), but none of them, with the exception of the Jack Rose, have been served at our monthly cocktail night before. Yes, there are a few Lauer Originals and obscure drinks hiding in the list: the originals will be covered soon enough, and the obscure ones are worth looking up. Good luck in your Googling! This entry was posted on September 27, 2012 by IJ Lauer in Blog Info, Cocktail Themes / Menus, Heron Social Club, Special Project and tagged autumn, cocktail menu, cocktail party, fall, list of cocktails.